Transfer-messenger RNA (right) compared with a typical transfer RNA (left). Damaged messenger RNA poses a double danger to cells. If a messenger RNA is truncated, it will be missing its stop codon, so it will encode a faulty, truncated protein. Also, ribosomes get stalled at the end of these truncated messages and are unable to release the mRNA and move on to the next protein synthesis job. Bacteria possess an ingenious molecular method for solving both of these problems at the same time, that destroys the faulty protein and releases the ribosome all at once. Transfer-messenger RNA, called tmRNA for short, rescues stalled ribosomes. It is composed of a long strand of RNA, several hundred nucleotides in length. The one shown here (PDB entry 3iyr ) is from Thermus thermophilus, and has 349 nucleotides, and a similar structure is available from Escherichia coli, which is slightly larger (PDB entry 3iz4 , not shown here). tmRNA folds into a distinctive donut shape with several functional parts. The two ends come together to form a section that looks remarkably like a transfer RNA, shown here in red (a tRNA is shown for comparison, from PDB entry 4tna). Like a tRNA, this portion is loaded with an amino acid, which for tmRNA is always an alanine. 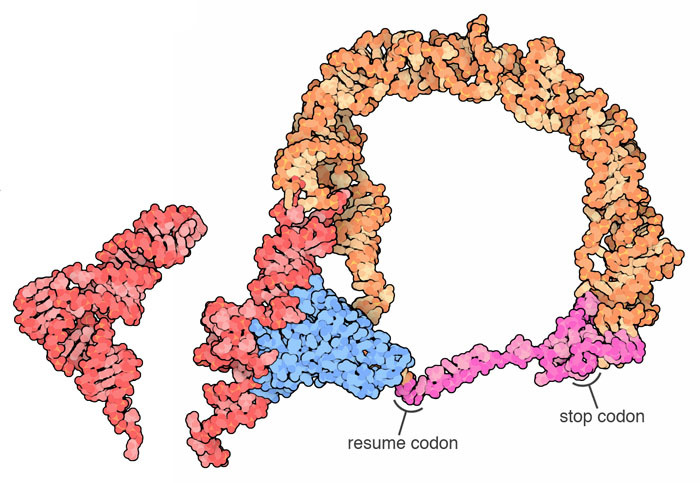 Next to this, there is a short section that acts as like a messenger RNA (shown here in magenta), that encodes a short stretch of amino acids, complete with a stop codon. SmpB, a small protein shown here in blue, assists the tmRNA. Several problems must be solved when tmRNA rescues stalled ribosomes. First, the truncated mRNA has been translated to its end, so the decoding site doesn't hold a complete mRNA codon. To solve this problem, the tRNA-like portion of tmRNA inserts into the ribosome and the SmpB protein fits into the decoding site, replacing the normal codon-anticodon interaction. Then, protein synthesis needs to be resumed. The alanine carried by the tmRNA is added to the stalled protein chain and the mRNA-like section slips into the position normally occupied by mRNA. In the process, the truncated mRNA is kicked out to be destroyed by ribonucleases. The ribosome then steps along the mRNA-like stretch of the tmRNA, extending the truncated protein by a few amino acids and finally releasing it when the tmRNA stop codon is reached. This isn't the end of the story, however: the sequence of this short extension encodes a tag that is recognized by the protein degradation machinery of the cell, ensuring that the faulty protein will be destroyed. 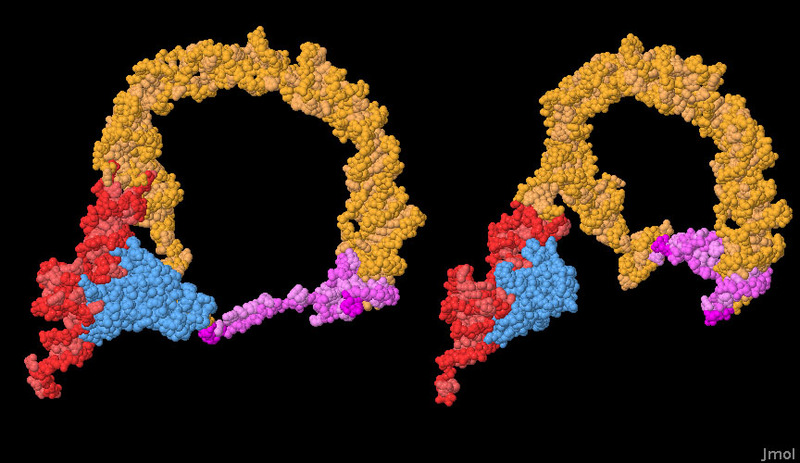 Transfer-messenger RNA (red) bound to a ribosome (blue and green) with elongation factor G (magenta) and a transfer RNA (yellow). Cryoelectron microscopy has been used to look at the structures of many of the steps in this process. The structure shown here captures the tmRNA just after it gets started translating the short extension encoded in the mRNA-like section (PDB entries 4v6t ). The structure includes an outgoing tRNA (yellow) and elongation factor G (magenta). A crystallographic structure is also available for a small fragment of tmRNA bound to ribosomes along with elongation factor Tu, showing the atomic details of the interaction of SmpB with the ribosome (PDB entries 4v8q ). As you can imagine, tmRNA must be very flexible to allow the tRNA portion to enter the ribosomal tRNA site, and the mRNA portion to feed through ribosome and be translated into protein. The two structures shown here (PDB entries 3iyq and 3iyr ) reveal some of this flexibility, showing tmRNA just after it binds to the ribosomal A-site, and after the tRNA-like portion has inserted into the ribosomal P-site. These PDB entries only include atomic coordinates for tmRNA and SmpB--you have to imagine the rest of the ribosome surrounding the structure. To take a closer look at these two structures, click on the image for an interactive Jmol. You can look at the cryoEM maps for these structures at the EMDataBank entries EMD-5189, EMD-5234 and EMD-5386. B. D. Janssen & C. S. Hayes (2012) The tmRNA ribosome-rescue system. Advances in Protein Chemistry and Structural Biology 86, 151-191. B. Felden & R. Gillet (2011) SmpB as the handyman of tmRNA during trans-translation. RNA Biology 8, 440-449. 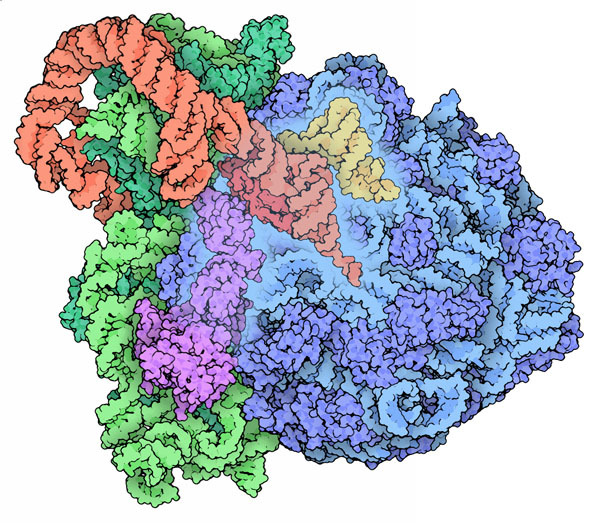 J. Fu, Y. Hashem, J. Wower & J. Frank (2011) tmRNA on its way through the ribosome. RNA Biology8, 586-590.